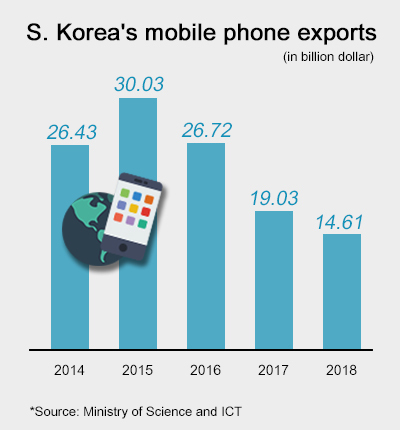 South Korea’s exports of mobile phones plunged 23 percent year on year to a 16-year low last year on sluggish demand from China amid fiercer competition from local names. According to the Ministry of Science and ICT and the Institute of Information & Communications Technology Planning & Evaluation on Sunday, the country’s mobile phone exports totaled $14.61 billion last year, down 23.2 percent or $4.42 billion from the previous year. The figure was the lowest in 16 years since 2002 when the country shipped out $11.36 billion worth mobile phones. Handset shipments peaked at $33.44 billion in 2008, outpacing the country’s another mainstay export item semiconductor’s exports of $32.79 billion, and then started to fall below $30 billion in 2009 and $20 billion in 2017. By region, mobile phone exports to China including Hong Kong plummeted 37 percent to $4.3 billion on year last year amid intensifying competition with local rivals such as Huawei. Shipments to the U.S., considered a premium phone market, lost 10 percent to $5.05 billion, but the decline was limited allowing the U.S. to replace China as the biggest market for Korean handset exports. Meanwhile, exports of semiconductors last year expanded to a record high of $128.15 billion, almost nine times larger than cell phone shipments. As Korean smartphone makers have fast lost ground in the world’s biggest handset market in recent years, they are forced to seek for breakthroughs by launching new budget phone models to expand presence in emerging markets and introducing high specifications such as a quad-lens camera, 5G network and foldable form factor to entice smartphone demand worldwide.